Recycling container nets and covers, otherwise known as waste management nets can be used for a variety of different industries and provides containment for items inside recycling bins, boxes and large containers. Our recycling container nets are available in different mesh sizes and densities or in a fine mesh depending on your requirements. 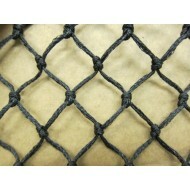 These nets can be made to your specific size requirements to cover a range of container sizes from small curb side recycling boxes to large industrial recycling containers. • Waste disposal site nets - these are ideally suited to securing waste in Lorries or skips whilst the load is in transit or being stored at landfill sites. • Skip waste nets - these can be placed over skips to ensure any loose debris or rubbish is contained whilst the skip is stationary or in transit. 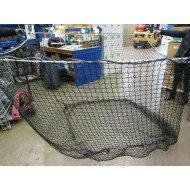 • Curb side recycling container nets - can be used for recycling and light waste control for your home. Having a net over your recycling containers ensure the load remains confined in windy conditions. • Industrial size container nets – these large heavy duty nets are used by schools, hospitals and councils for general waste management, in warehouses, on industrial sites and rubbish sites. The nets are manufactured in a number of standard sizes, however often they are tailor made to your specific measurements and requirements to ensure the contents of the containers are held securely in place. 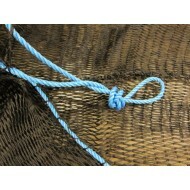 When these nets are full, they can be lifted out safely and securely by using the four lifting loops in the corners. 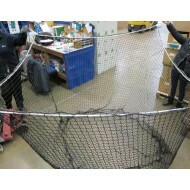 This large heavy duty net is popular for use by schools, hospitals and councils for general waste ma..